1. William Bean (208) was born either 1773 or 1777. His birthplace has not been established with any degree of surety. Some researchers say Rowan County, North Carolina, others South Carolina, date 1773 or 1777. He is often confused with William Bean (b. 1754, South Carolina). There is a William Bean family in Rowan County in the 1820 Census, two families in 1810, one in 1800, and none in 1790. According to family records William Bean of Rowan County was born in 1773, and he had a brother Jesse Bean who lived in Moore County. William was, according to this, 17 years old when the first census was taken. He would have been 27 in the 1800 census. William made his home in Rowan County, North Carolina. It is now Davidson County. His home adjoined the land belonging to John Peacock and Anna Gallemore. He owned a mill, but whether it was run by a sluice from the Yadkin, or by a smaller stream emptying into the Yadkin, is not now known. A great-grandson, C. G. Sullivan of Moore County, North Carolina, said that William died at the home of his brother Jesse near Carthage, the county-seat of Moore County before 1830. His mill was left to the youngest son by the second wife, Daniel Bean. Two of William's sons married two of the neighboring Gallemore girls and came to Kentucky in 1833. By the first wife, Celia Wyatt, there were seven children: John, William Collins, Jesse, Phoebe, Elizabeth, Rachel, and Celia; and by the second wife, Ruth Marshall, there were two sons, Joshua and Daniel Bean. There is much confusion about the ancestry of William Bean, due to the common use of the name. Some sources attribute as many as 24 children to William Bean and Celia Wyatt, but many of these can be shown to belong to another generation, and probably belong to another family entirely. Everyone seems to agree that William Bean married Celia Wyatt, but which William Bean and when is open to debate. The families to which William Bean is claimed to belong have no siblings named Jesse. On the other hand, the story that he died in the home of his brother may be incorrect. He did have a son-in-law named Jesse Sullivan, whose family resided in Carthage, and also a son named Jesse.11 Twenty one or more children have been accredited to William Bean and Celia Wyatt, but the ages and dates quoted make this highly unlikely. Seven of the children -- John, William Collins, Jesse, Rachel, Betsy, Phoebe, and Celia -- are well supported, except for the identity of the mother. The rest probably belong to another William Bean, perhaps his father. Since the original source from which many researchers have deduced this marriage is not documented in any that I have seen so far, it must be considered conjectural. Most of the researchers seem to be quoting each other. Several other researchers found on the internet have reached different conclusions about the parents of many of these offspring. In one of the oft-quoted sources, Beans from all over several states (Kentucky, Tennesse, North and South Carolina, and Arkansas) are collected as though they are all related, with little regard to geography. This is sloppy research indeed. Even the punctuation is frequently ambiguous, so that you have to read it again and again to figure out what the author is intending to say. The record continues with more inconsistencies, tracing several of the families for several generations, until one gets weary of trying to make any sense of it. The more these sources are studied, the less confident one becomes that any of it is correct. Their is still a large looming question of why is Jesse, the brother of William, not mentioned at all? The only Jesse in the whole family is his son. Or is he? William who married Anna Buckalew (another candidate couple) died in 1809 in Lincoln County Missouri, yet we have a clear statement that our William died near Carthage, Moore County, North Carolina in 1829 in the home of his brother Jesse. So that eliminates William and Anna as candidates. But it could also be that the statement is in error. Perhaps he died in the home of his SON Jesse. If William and Celia are the true ancestors then there must be an adjustment in their marriage date by about 25 years, or in the identity of their parents. I would assume the former. I am guessing that the circa 1776 marriage date quoted by several sources is based on the incorrect assignment of children who are really William's siblings. William made his home in Rowan County, North Carolina, part of which is now Davidson County. According to Smith and Edwards, his home adjoined the land belonging to John Peacock and Anna Gallemore. On the 1800 census, William Bean is found on the same page as Elisha, James, John, William, William Sr, and William Jr. Gallemore. There are no John Peacocks. This may have been a mistaken deduction derived when Richard Edwards thought John and Anna's surnames were reversed, and the John Gallemore who lived nearby may have been another relative. It is also possible that John Peacock was also known as John Gallemore, since his children bore that name. An examination of the census records (not just the index) may be instructive. Celia Wyatt (209) was born circa 1776 in North Carolina. + 2. i. John Bean (205), born 27 Feb 1802 in Rowan County, North Carolina; married Rachel Wyatt (207). + 3. ii. 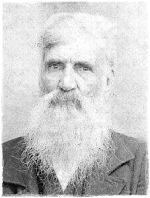 Jesse Bean (1042), born either 1804 or 1805 in Rowan County, North Carolina; married Leah Gallemore (1041). + 4. iii. Rachel Bean (1092), born between 1804 and 1814 in Rowan County, North Carolina; married William Crook (1091). + 5. iv. Elizabeth C. Bean (1093), born between 1806 and 1812 in Rowan County, North Carolina; married William Cornelius Hurley (1087). + 6. v. William Collins Bean (410), born 15 Dec 1808 in Rowan County, North Carolina; married Barbara Ann Gallemore (408); married Catherine Watson (1024). + 7. vi. Phoebe Bean (1094), born circa 1810 in Rowan County, North Carolina; married John Morgan (1088). + 8. vii. Celia Bean (1095), born 1819 in Rowan County, North Carolina; married Jesse Sullivan (1089). Ruth Marshall (210) was born circa 1773 in North Carolina. She married _______ Marshall (211).15,16,17 She died in North Carolina. According to the 1850 Census- Population Schedule [F.2.609 P], Ruth Bean resided in the home of her daughter, Rebecca Davis (Age- 30) and her family, Henry (Age- 11), Ivy (Age- 10), Elizabeth (Age- 8), Sarah (Age- 5) & Louisa E. (Age- 2) in the Southern Division, Davidson County, NC. The following information was recorded on October 23, 1850 on Page No. 364; Line No. 17- Dwelling No. 713; Family No. 728: Ruth Bean, Age- 56, Female, Listed as cannot read or write. According to the Davidson County, NC Wills (1823-1940) CR # 032.801.1- Bean, Ruth (1852) Will Dated- January 10, 1852 & Codicil Dated- January 10, 1852; Probated- May Term 1852. Son, Daniel Bean- 50 acres on the north side of my tract on which he now lives. Mentions- Henry (Stewart's) Stuert's corner, the end of Stephen Harrises meadow, Osborn Skeen's line, in (Benjamin) Benharmine Lanier's line. Also another tract on the south side of my land of 40 acres. Mentions- Stuert's line, in Simeon Sheet's line. Daughter, Rebecca Davis and my four grandchilden- Henry, Ivy (Abstract- Jerry), Elizabeth and Sarah Davis- 50 acres (Abstract- 60 acres in the middle part of my land on which they live; with all my personal property). Mentions- Daniel Bean's corner, in Stuart's line, Daniel Bean's corner, in Osborn Skeen's line. Son, Joshua W. Bean- 50 acres in Montgomery County, NC on the waters of Spencer's Creek and Enoch's Creek. Adjoining the lands of Daniel Hurley and others. Ruth (her x mark) Bean (Seal). Witnesses- John Thompson (Jt.) & Attest- A. G. Johnson. Recorded in Bound Volume 2; Pages No. 65-67.